New Album Family Recipe Available Now - Check It Out! All My In-print CDs Now Available As MP3s! Family Recipe (9/2018) is Michael Jerling's tenth album, a collection of twelve new original songs. Included are a country ballad, "In Lieu Of Flowers," a poignant look at family with the folky "Family Recipe," a bit of fingerpicking whimsy with "That's Why Republicans Hate Trains," and a waltz-time look at European café society between the wars in with "When Words Still Mattered." Visit the album page for more about it and clips of all the songs. We have the CD in stock now in our Fool's Hill Music store. 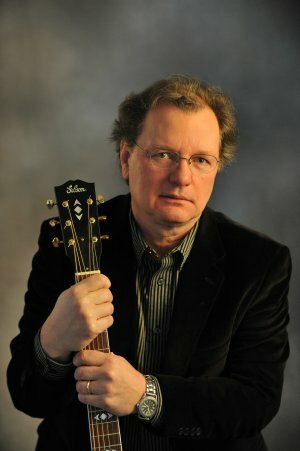 His previous albums include Halfway Home, released in 2013, and a live album, Music Here Tonight, recorded at Caffè Lena in Saratoga Springs in June 2009 and released that September. Name and address are optional. However, if you provide just the geographic information (city, state, zip), Michael can tell you when he is touring in your specific area. If you provide your name and full address, then Michael can also send you an occasional postcard. If you are already on the list, but want to add your name or address, just signup again. You will still be on the list only once.